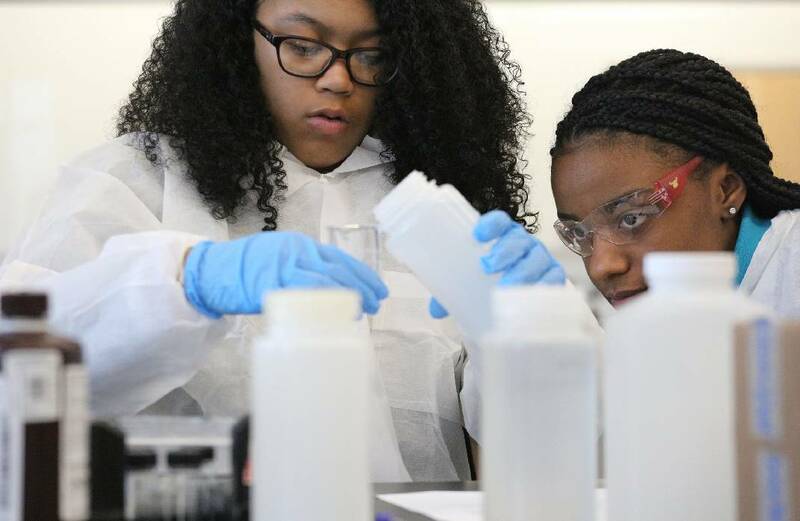 Chattanooga Girls Leadership Academy students Avery Love, 15, and Taliyah Sanford, 14, measure out water samples for testing Tuesday, January 15, 2019 at the Tennessee Aquarium Conservation Institute in Chattanooga, Tennessee. Students broke out in groups to do a variety of tests with Tennessee American Water representatives. Ten girls poked through leaves, searching for tiny critters hiding in a temporary habitat in bins on tables in a lab at the Tennessee Aquarium Conservation Institute. It was just the latest trip for the freshmen students involved with a partnership between the Chattanooga Girls Leadership Academy and Tennessee American Water designed to show girls different career opportunities. Ten of the top freshmen, who were selected for the program due to their attitudes in school and work ethic, looked closely at what first just seemed like a pile of leaves in a plastic bin. As they looked closer, they saw what they were searching for: benthic macroinvertebrates. With the help of biologists, they had learned that meant small animals without spines living among stones, logs, sediments and aquatic plants at the bottom of the Tennessee River and its creeks and streams. "Oh my God, there's three of them right there," a student excitedly said as the girls hunched over desks in the institute's flex lab. They studied the barely visible creatures through lenses and used information sheets to identify the different types of critters. They examined shapes and features — "this one has tiny legs," one student observed. They looked through their chart and narrowed it down to either the sow bug or a similar-looking scud. The creatures quickly earned names as they found more and more. There was Sasha, Sal, James, Michael and Vanessa. Tennessee American Water has partnered with the school for about three years. The students meet with the company once a month to learn about different career opportunities and take part in hands-on activity. Usually, the trips involve tours of different areas of the water company: quality specialists, geographic information system analysts or an environmental compliance officer. The girls learn about the career opportunities in the community, discuss paths to reach their goals and plan for the future. "They really show a different way or a different career path we can go down instead of just the ordinary doctor or dentist," student Avery Love said. "We get to see how a degree can actually take you a long way. So we work with them either in the field or behind a computer." The focus of the conservation institute visit was to learn about the biodiversity right here at home while learning about water quality from the river to the drinking supply. The aquarium personnel showed the students how water quality in rivers and streams is important to the region. The macroinvertebrates are indicator species for the health of the water. Students also visited the institute's propagation room to see work biologists are doing with threatened and endangered species while learning how the aquarium's partnership with the Tennessee Valley Authority and the Clean Water Act helped revitalize much of the region. Then, Tennessee American Water showed how water quality monitoring is done for the area's drinking supply. The company set up stations and the girls tested for bacteria, conducted quality control assessments and tested water to make sure there was an appropriate amount of chemicals. The work allows the students to them to "see what else is out there, and it gives them encouragement," Tennessee American Water senior water quality specialist Kim Pritchett said.